Overgeneralising is a quick way to get yourself into trouble these days. Try to summarise a political party by using a single politician as an example, and people around you will quickly see your ignorance is showing. Tell a bunch of metalheads what the metal genre is like because you heard one Metallica track about ten years ago, and you’ll soon get punched in the face. When it comes to the medium of animation, there are enough toxic myths and generalisations floating around to choke a dolphin. But choke no more, my tuna-safe friends, because today we’re looking at four common myths about animation and the truths that will, hopefully, prevent you from becoming a punched-in-the-face-ignoramus. Here’s the short version for busy people: Animation is an art form. Animation is a legitimate way to artistically present your product / concept / story to other adults. The only thing that makes an animation ‘for kids’ is the writing. And this is exactly the same case for live-action. So why do we see animation as a childish medium? Or more accurately, why is there a perception among many adults that you must visually show real people to be taken seriously? This is an odd myth in particular, because it only appears within the realm of motion graphics. In the world of visual art, nobody has the lack of awareness to dare say that photographs are the only legitimate media, and paintings are just for kids because they’re ‘not real’. The reason this myth came about initially is because a number of the earliest examples of animation were, by coincidence, made for children or based on childlike folktales. From then, a continual perpetuation of this unintentional stereotype made many people assume that entertaining children was animation’s only use. Nowadays, animation is used not only for adult-targeted animated television (though it’s still largely bound to the comedy genre in the Western world), but as a distinctive method for creating corporate videos, contrary to what myth #2 would have you believe. Given the sheer outweighing of live-action material on TV, movie screens and Youtube, one could be forgiven for thinking this was the case. But there are many reasons for animation being less abundant than live-action, not limited to the increased amount of time, manpower and specialist knowledge it takes to create a good animated product. But it is for these very reasons that animation can work in your favour. Why does a piece of fine art sell for up to millions of dollars? Why do the guys on American Pickers get excited when they stumble across a piece of folk art pottery? Because despite what the digital age would sometimes have you believe, people appreciate human-crafted art. People appreciate originality, they appreciate products that are skilfully shaped for a specific purpose, and they appreciate seeing things they’re not completely bored of. The sheer amount of live-action product dilutes the chances of your video being memorable. Animation is a constantly evolving medium, encompassing many forms and genres. Different animators will bring a different flavour to their animations, resulting in unique visual products with individual artistic fingerprints built into them (metaphorical fingerprints that is… unless you’re going for the Mr Men look. In which case that sounds awesome). Of course, if you’re tossing up between producing a live-action or animated video for your company, product or message, the best advice I can offer is to pick the medium which is going to work best for that message. The Dumb Ways to Die ad campaign from Melbourne’s Metro Trains would’ve been comparatively stale and cheesy in live-action (and nobody likes stale cheese), just as the Rhonda & Ketut ad series from AAMI probably wouldn’t have been as memorable had the characters been animated, due to the reliance on subtle comedic acting. This is an interesting myth, because it’s not entirely untrue. Yes, some animation does look incredibly cheap. Some styles will lend themselves to looking cheaper than others. Some animation is quick and dirty, though in general it’s a longer process than live-action. But all these attributes apply equally to live-action, yet there is no prevailing myth that “film looks cheap”. In fact when it comes to longevity, certain animation forms excel above live-action, because live-action film ‘ages’ a lot quicker than established forms of animation (like frame-by-frame 2D animation, for example). Cinematography from the 80’s will always have to deal with 80’s haircuts, clothing, film grain, special effects, people in giant cumbersome turtle suits which looks positively laughable these days because, honestly—who in their right mind ever thought it would be a good idea to turn TMNT into a live-action movie? Sure, money-grabbing executives wanting to ride the coattails of the popular animated series, but people with a single aesthetic bone in their body? No. Meanwhile, there are 2D animated productions that still stand up as products that could’ve been created today (if it weren’t for Hollywood’s perplexing mission to stamp out everything that isn’t CGI). Heck, despite the lightning fast technological changes in the 3D world, even Toy Story still looks fresh out of the studio, and that movie’s 20 years old. That’s right, that university-aged animation still looks like a newborn, still full of potential and enthusiasm and not paralysed by HECS debt and an uncertain job market. If you’re after a video only for the here and now, then both live-action and animation can work for you. If you want your video to stand up five, ten, twenty years from now, then animation could be the more effective medium. While we’re speaking of Toy Story, remember in the mid-90’s when Toy Story‘s success started everyone talking about how 3D animation was the “way of the future”? And shortly before that when The Lion King was a smash hit and there were suddenly a spate of 2D feature films in production? And then in the early 2000’s, when homemade internet Flash cartoons were all the rage, and everyone knew this was going to change the landscape of the industry forever? For those who aren’t necessarily interested in animation, these landmarks can tend to make animation seem like a ‘fad’, a passing genre trend, because these are the moments where it momentarily floats above the rest of the media pile and into the general public consciousness. And for someone who doesn’t dig any deeper than mainstream media outlets for their entertainment, who doesn’t know how or why the media industry sustains itself, then these assumptions are to be expected. But those more interested in the industry know that animation is not a genre at all—it’s a medium, more akin to the games industry than to ‘romantic comedies’ or ‘musical space westerns’. The history of animation as a medium is, like all media, a fluctuating one that has depended on waves of income, advertising momentum, public exposure, social trends, and the thing executives always conveniently forget: new ideas. And while I’m not going to sit here and lecture you on the history of animation (though I could probably chat all day solely about the nuances of early 90’s animated television), I will say that it is extremely hard to call an entire creative industry a fad and have any evidence to back up your claim. Sure, the popularity of animation in the public eye waxes and wanes, just as any medium does. However, a quality product is a quality product as far as art and media goes, and a marketing team can do a lot more with a quality product in an underused medium than they can with a poor product in an oversaturated market. 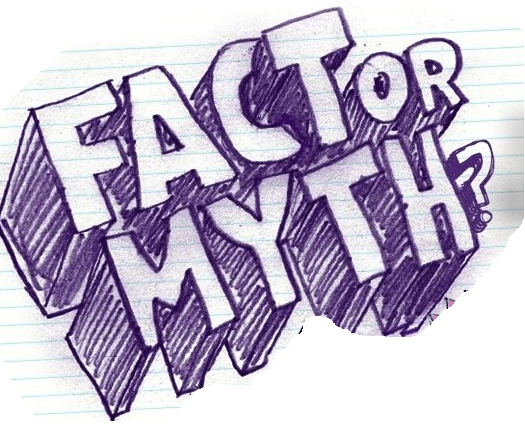 I’ll be the first to admit I’m biased when I jump to defend animation against negative myths. To me, animation is a beautiful medium in a complex industry with a fascinating history. But even if you don’t share my borderline obsessive enthusiasm for the art form, it’s always useful to get the information you need to formulate an educated opinion about a subject, instead of blindly listening to myths and generalisations. On an unrelated note: did you know that 70% of all animated movies contain a metalhead dolphin in the background being punched in the face? It’s true.